Interview with What’s in the Name | WhatsTheScene? WTS: So how did you guys start out? Give us a little intro! WITN: We started initially as a college band. All of us were from different colleges and our first college competition was Kiran (KC College, Churchgate) though we didn’t win but the true dedication and our love for music kept us going and we participated in many other college competitions across Mumbai and other major cities in India. After doing local college competitions we focused on doing National level competitions and that got us the first place in the Channel [V] Launchpad competition 2012. Thereafter, there was no turning back for the band. WTS: Do you identify with a certain genre? Tell us a bit about your musical influences. WITN: We don’t really put ourselves under a particular genre because all of our songs don’t have the same sound. It’s all a mix ‘n match of different genres co-operated by all the members in the band. Our influences derive from Bollywood to any progressive metal band like Dream Theater. A few major genres that we’ve worked on all of our original compositions are like Ballad Rock, Alternative Rock, Pop, Dubstep, New-Age Rock, Metal, Hard Rock, Funk and Rock ‘n Roll. WTS: What goes into the songwriting process, thematic, technical and otherwise? WITN: The best part about the band is everybody is a song-writer and a good composer. All of our songs have a deep meaning and it’s written out of a personal experience and mood. We believe in the simple technique of what you feel, what you know, what you see, just write it down – rest, the song is composed when all the five members sit together and compose. WTS: What would you say makes your music distinguishable and unique? 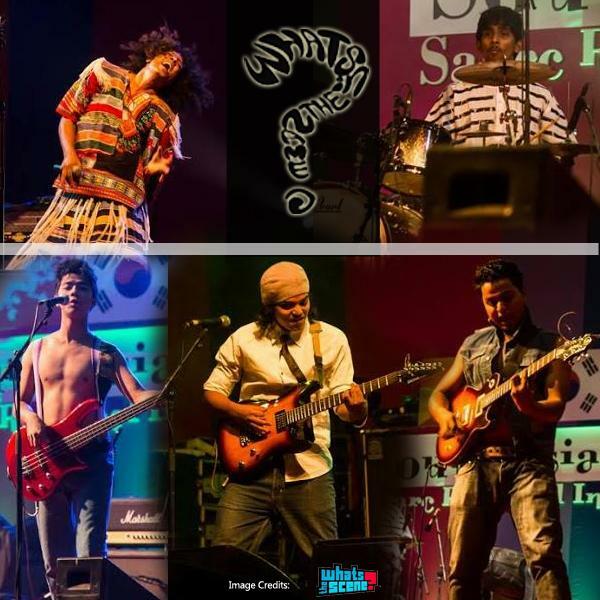 WITN: More than we consider ourselves as a unique band or our music is unique our fans and the veteran musicians in the country have said it .Our live acts, lyrics and the compositions are very different to all the music that other bands play in the country. We believe in having fun on stage so not just our vocalist Clince Varghese, who is known much for his jumps on-stage and off-stage but all the members in the band make sure they have fun on-stage and off-stage which we believe makes us unique. WTS: What is on your plate right now and in the coming weeks? WITN: At present we are shooting for India’s Got Talent for the quarter-final round and we are really looking forward to the show which should be aired in just about 2 weeks. And next is our 4 concert tour in the Maldives for which we left on the 22nd of January and are returning on the 27th of January and we are really excited to perform as it is our first international tour. After returning from the tour we have some major college headlining gigs scheduled which we are really looking forward to. WTS: How has the response been to your music so far? WITN: Since the first day of our performance we’ve always been people’s choice, they have loved our music and the way we put it across to them it gets really easy for them to connect with our music. So far we’ve been appreciated wherever we’ve performed and we are really working towards them loving us more and more and we would like to thank all our fans who have supported us so far and we promise to entertain them as long as we can!